The year 2017 has seen some of the warmest temperatures ever recorded, only slightly below 2016. In particular, 2017 has seen unusually warm temperatures in the Arctic, continuing the long-term trend of rapid warming and sea ice decline in the region. The Arctic region has warmed more than twice as fast as the global average — a phenomenon known as Arctic amplification. After record warm wintertime temperatures in the Arctic, the sea ice maximum extent set a new record low on March 7, 2017, at 5.57 million square miles (14.42 million square kilometers) in satellite records dating back to 1979. This record was slightly lower than the previous records set in 2015 and 2016, meaning maximum sea ice extent has been record low for three consecutive years. In September, sea ice shrunk to 1.79m sq mi (4.64m sq km), making it the eighth lowest minimum extent on record. Accelerated warming in the Arctic increases global sea-level rise, greenhouse gas emissions, and affects weather patterns in lower latitudes. The Arctic is warming at a rate approximately twice that of the global average. 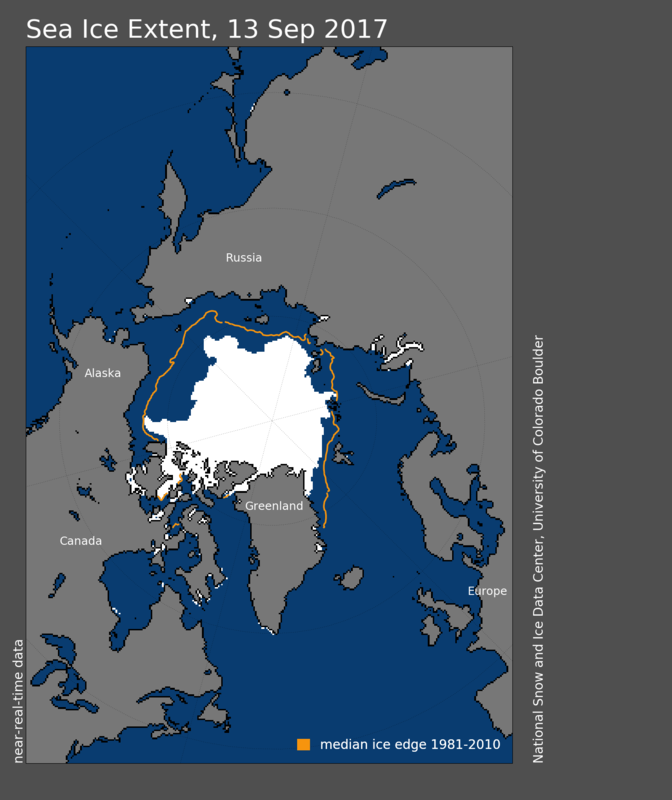 Maximum winter sea ice extent in the Arctic was record low for the third year in a row. Winter Arctic warm waves in recent years are consistent with trends showing an increase over time in such events. At least 50 and 70 percent of Arctic sea ice decline in recent decades is attributable to human-caused global warming. The first four months of 2017 brought unusually warm and record temperatures to the Arctic, even after the temperature spike associated with the 2015-2016 El Niño had faded. During March, a large area of Siberia and the Russian Arctic experienced the hottest temperatures on record for the month (see image to the right). There has been an increasing number of winter warming events in the Arctic in recent years. Extreme warming events—associated with temperatures near or above 0°C, lasting one to three days—occurred in the Arctic during the winters of 2017, 2016 and 2015. Temperatures in the Arctic at this time of year are typically below -22°F (-30°C). April 2017 sea ice extent was 6.9 percent below the 1981-2010 average. Maximum daily sea ice extent was reached on March 7, 2017. It beat the previous record (set in 2016) for smallest maximum winter extent since satellite records began in 1979, measuring 5.57 million square miles (14.42 million square kilometers). The previous record holders for low-wintertime-maximum extents included 2015’s maximum of 5.605m sq mi (14.517m sq km), and 2016’s maximum of 5.606m sq mi (14.52m sq km). Arctic sea ice reached its summer minimum on September 13, with its smallest extent for the year recorded at 1.79 m sq mi or 4.64m sq km. This is the eighth lowest summer extent in the satellite record. Before 2007, the minimum summer extent had never fallen below 1.93m sq mi (5m sq km). From 2007 to 2017, this threshold was crossed eight out of 11 years. The all-time record low summer minimum sea ice extent occurred in 2012 at 1.4m sq mi (3.63m sq km). A National Snow and Ice Data Center (NSIDC) scientist, commenting on the low extent in 2017, stated that the year's sea ice minimum indicates the long-term downwards trend has continued with sea ice extent falling below 1.93m sq mi (5m sq km).